So do orthotics work for Morton’s neuroma? Many foot specialists understand that Morton’s Neuroma is either caused or at least aggravated by weight bearing activity. Every patient reports that their pain is directly related to walking and standing activities. In fact most patients eventually eliminate many weight bearing activities in order to control the pain. First to go are those activities that are non essential, like exercise, walking your dog. Often patients need to change jobs in order to get off of their feet to control pain. Eventually the inability to walk without pain diminishes their quality of life. So why is it that many foot specialists don’t even bother to try orthotics as they treat Morton’s Neuroma. Clearly all orthotics or arch supports attempt to change and improve the way we walk and stand. If Morton’s Neuroma is caused by the way we walk, why aren’t orthotics used as the treatment of choice? Why do podiatrists use custom orthotics as the primary treatment for Plantar Fasciitis, also caused by weight bearing activity, but don’t bother to try them for Morton’s Neuroma? Will orthotics, inserts, arch supports work for Morton’s Neuroma? Even though physicians are reluctant to use custom orthotics, a non covered expense by most insurance companies, patients often find some benefits from a variety of arch support products. 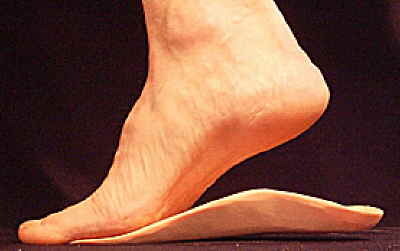 Most long term sufferers from Morton’s Neuroma eventually gravitate to shoes with arch support. Although flip flops are the most popular shoe type in the early stages of this condition. It becomes apparent that shoes with support are far preferable, and control the pain much better that flat shoes without support. Most of the long term patients tell me that for a period of time support sandals controlled the pain, but NOW they quit working. I ask them why wear them if they don’t work? The patients explains that they are better than nothing. Although in shoe support eventually fails to control the nerve pain, most patients find that it is helpful, and continue to wear only shoes with built in support like, Vionics, Berkinstocks, and Fit Flops. How MUCH do orthotics actually help with Morton’s Neuroma? So it should be obvious that some form of support helps to control the problem that is generated when we walk, run, and stand. Equally as obvious is that they do not work well enough to stop the progression of Morton’s Neuroma. Eventually even when it is clear that they help control the pain, it is obvious that they do not do it well enough to arrest the progression of this painful condition. By the time most patients seek help from a physician, the condition has advanced to a point where custom orthotics provide little to no help with the pain. Do Orthotics work for Morton’s Neuroma? Do they stop all of the pain? Although arch supports/ orthotics provide some relief of the painful symptoms, both physicians and patients agree that they do not work well enough to stop the progression of the condition. Eventually even those who find significant benefits from support sandals and custom orthotics in the early stages of this condition, realize that they have very limited value once the Morton’s neuroma advances to end stage. So why do orthotics work for Morton’s Neuroma? What is it about arch support products that help some, but ultimately fail to control the progressive nerve pain? Do they change the way we walk and stand but just not enough to stop all of the pain? If you could create custom orthotics that worked significantly better than what is currently available, could you stop the progression and control the disabling pain of Morton’s Neuroma. Do Theta Orthotics REALLY work for Morton’s neuroma? Thirty five years ago I developed a neuroma. Knowing the devastating outcome long term, of this painful condition of the inter-metatarsal nerves, I was intent on finding help, in an effort to avoid inevitable neuroma surgery. It took me 4-5 years but eventually I identified the design properties of any support/orthotic responsible for the desired changes in our gait. Not only did I learned how to improve the benefits of custom orthotics, but I quantified the design. I learned that every time I increased the angular correction by 5 degrees that I doubled the benefits of the device. 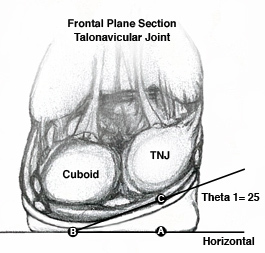 I learned that if I got the correction high enough I could STOP the progressive pain associated with Morton’s Neuroma. The increased correction provided do work for Morton’s Neuroma. Over the last 35 years I have now treated more than 14 thousand neuroma patients successfully without surgery. I have treated patients in the early stages and in the advanced stages with this improved angular design. I have successfully treated patients who have tried every treatment available, including multiple failed surgeries. Once I learned how to improve the way orthotics work significantly, it put me out of business as a neuroma surgeon. Orthotics do in fact treat the cause of Morton’s neuroma, and when they control foot function well enough to stop the progressive nerve pain. Do not consent to surgery, do not accept the pain, and do not eliminate activities that are important for a healthy life style. Do orthotics work for Morton’s Neuroma? Theta Orthotics will stop the pain of your Morton’s Neuroma as you continue walking running and standing. Do orthotics work for Morton’s Neuroma? Call 801-651-3067, stop your pain, avoid surgery, resume a healthy lifestyle.